The stakes of the 2018 midterms seem huge. Democrats believe they can win back control of the U.S. House — maybe even the Senate — and move policy decidedly to the left. Then they’ll set their sights on the White House in 2020, dreaming about what they could accomplish with full control of government — and how much voters would reward them. But perhaps Democrats shouldn’t get their hopes up too much. Republicans now control all branches of government but have scored only one major legislative victory, and they are facing a substantial backlash. The GOP’s current situation raises these questions: Can either political party maintain power while enacting its agenda? Or are governing majorities transient, with policy victories sowing the seeds for future electoral losses? The evidence we have suggests the latter. When Democrats historically have tried to enact a spate of liberal policies, Republicans have made gains and public opinion has moved in a more conservative direction. Likewise, when Republicans have passed more conservative policies, Democrats have made gains, and public opinion has moved in a more liberal direction. It might not sound intuitive, but policy victories usually result in a mobilized opposition and electoral losses. Or, put another way, voters usually punish rather than reward parties that move policy to achieve their goals. In the chart below, I plotted the relationship between the net number of liberal laws3 passed by each Congress and the change in the Democrats’ share of the popular vote in the House from the previous election. It is not a perfect relationship (the correlation is -0.47), and there were outliers, including the 1964 election following the Kennedy assassination and the 1974 election after Watergate. But there were three cases that seemed to capture electoral fallout from high levels of liberal policymaking. Democrats last completely controlled the federal government in 2009-10 and used that control to enact a long list of policy priorities — only to be met with a massive electoral backlash in the 2010 midterms. Two other elections with the largest changes in partisan vote share from the prior election were in 1966, after Lyndon Johnson’s Great Society, and in 1994, following Bill Clinton’s initial legislative agenda. It is not any easier for Republicans. They, too, have lost congressional seats and pushed public opinion to the left when they succeeded in shifting policy even a little to the right. 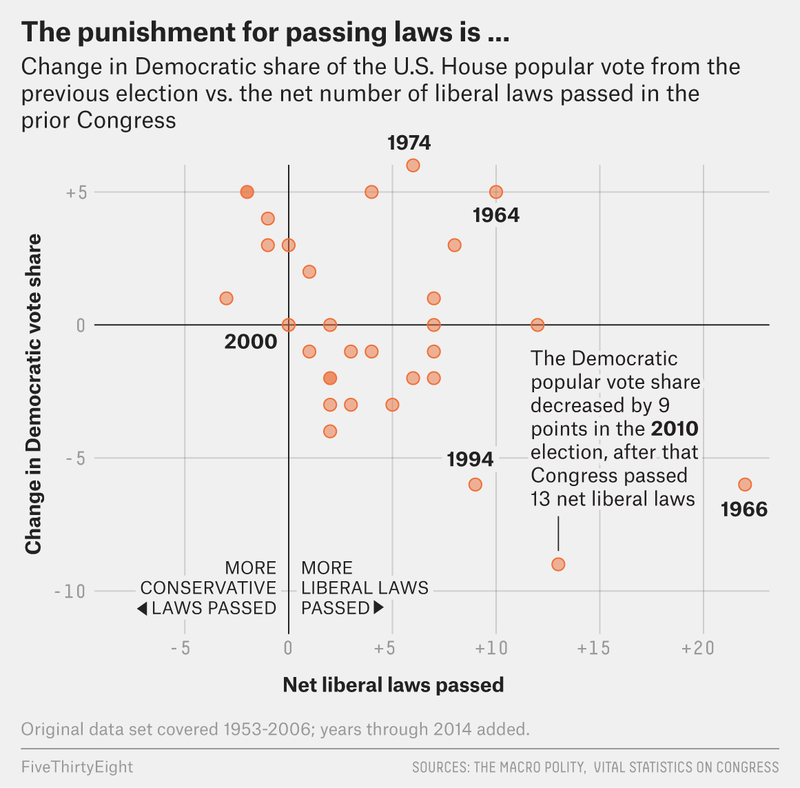 Democrats have gained vote share after every Congress that passed more conservative than liberal laws. It’s notable that GOP-controlled governments haven’t tended to push overall policy that far to the right. Republican presidents have typically paired their conservative policies with liberal compromises — such as George W. Bush’s tax cuts along with a new health entitlement. The current Congress would be an outlier, even among those under Republican presidents, in pursuing no liberal laws. So why do American politics seesaw back and forth? Some of what I’ve captured might be attributed to the well-known phenomenon of midterm loss: The party of the president tends to lose seats in a nonpresidential election. But it is unclear if midterm electoral backlashes are a certainty or a response to a president’s specific policy agenda. This can be hard to disentangle as new presidents often pursue big agendas in the hopes of shaping policy in their ideological mold. But there is a deeper problem: Neither party seems capable of sustaining a public majority to carry out its governing vision to completion. Today’s governing majorities are simply too narrow and short-lived to restructure government. The parties have recently swapped who commands the Oval Office and regularly compete for control of the House and Senate. Despite predictions of one-party dominance, both parties remain competitive. This reflects the American public’s inconsistent views. Americans have long-agreed with Republicans in broad symbolic terms while agreeing with Democrats in concrete policy terms. Politicians promise that they will win over converts with their policy success, but the public nearly always becomes more liberal during Republican presidencies — as it is doing now — and more conservative under Democratic rule (as it did under Obama). Partisans tell themselves that this time will be different, that the final vanquishing of their opponents is just around the corner. But even maintaining a narrow majority for more than four years would be unprecedented of late — much less winning a long-term partisan war. Rather, the historical record suggests that the price for enacting a large ideological policy agenda may be losing the very power that made it possible. The original book covered 1953 to 1996; the book’s authors updated their data through 2006, and I amended the categorizations with information through 2014. The data was all based on David Mayhew’s list of important laws. In my own analysis, I tried to be consistent with the “Macro Polity” authors. I did not find substantial differences based on close judgment calls. The number of major liberal laws minus major conservative laws. Our analysis includes laws passed in lame-duck sessions of Congress. We did not exclude them from our analysis as these were included in the original “Macro Polity” analysis and generally involve a small number of laws. In each election, the governing party faced a few more percentage points of popular vote loss than would be expected from the chart above based only on their laws passed.